One movie that comes to mind when I think about taking on this 365 Dishcloths project is Field of Dreams. In it Kevin Costner builds a baseball field and then all the baseball legends come to play. Many people doubted he could do it. With the help of Wendi our pattern editor, Zac our webmaster, Jen, My husband and all of you we can do it!! 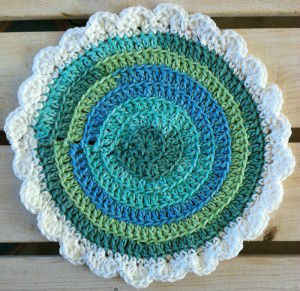 Enjoy the Circles and Shells Crochet Dishcloth and more designs in the Crochet In The Round Dishcloth Set. This one was fun! I used a yellow & white variegated with a white edging and it looks just like the sun! Should round 3 start with, “Ch3, 1 dc in same space”?? That missing dc seemed to make my dishcloth not lay flat and I had to frog and start all over….